Some organizations have an approval process in which one person sends and approves all purchase orders. This is extremely valuable when ordering across multiple projects and generating larger purchase orders to help get discounts and cheaper freight. For the smaller companies that don't have to deal with some of the troubles of being a larger company, this may not be the most efficient way, ordering directly from a project will be more efficient. For the larger companies with overlapping projects, being able to mark products as ready to order will allow you to be more efficient and save money. To request products or simply mark them as ready to order, you can select one or multiple products at once, and then click the 'Ready to Order' button in the sidebar. After clicked, these products will be have their Order Status updated to Ready to Order. These will also be available in the list of products ready to order across all projects INSERT LINK. Again, utilize the filters on the left to help you select multiple products to mark as Ready to Order. Also take advantage of the select all to make this process more efficient. 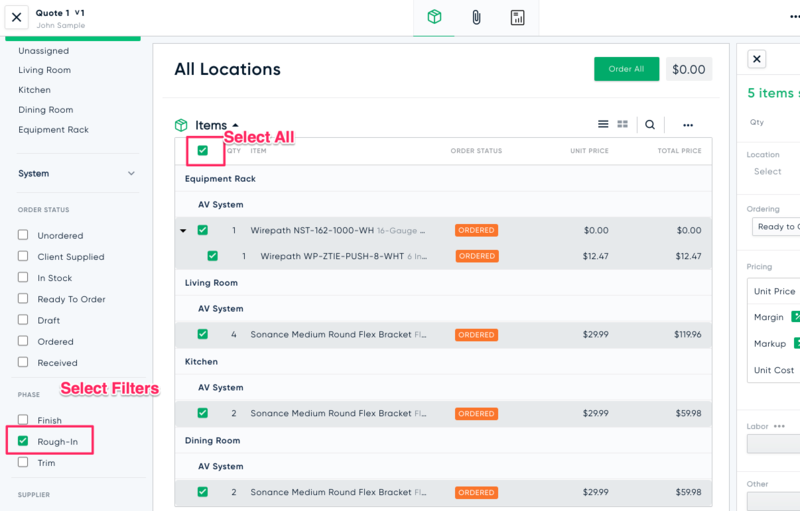 If you accidentally mark a product as ready to order, you can always change its status back by clicking on the arrow in the ordering section and selecting 'Not Ready for Order'. In the project bill of materials, we have added some filters to the left sidebar. Here you can filter by phase, order status, supplier, brand, and category. And of course you can still view by location and system. This makes it really easy to filter by Trim, Order Now, and send out the purchase orders.